Hi everyone, I’m Katie Allison, a senior psychology major at UMBC, with two minors in linguistics and music. In a few days, I’ll be flying across the Atlantic to arrive in Tel Aviv, Israel for a two-week course on Industrial/Organizational Psychology. You may recognize me from several UMBC institutions; I give campus tours, review my peers’ resumes at the Career Center, and frequently appear onstage with Musical Theatre Club. This course is actually taught by UMBC faculty member Elliot Lasson, and I’ll be joined by 15 other UMBC students. Most of the classes will be held at Tel Aviv University, until we move to the historic city of Jerusalem for the last few days of the trip. As someone who enjoys learning outside of the classroom, I’m most excited about the excursions that are included in the course. Even though the course is only two weeks, we’ll have educational field trips to Ashkelon (did you know Baltimore has a sister city in Israel? ), and Hadassah Hospital in Jerusalem. I know very little about I/O Psychology, so I’m really excited to learn more about this emerging field – and learn more about the master’s degree in I/O psychology offered here at UMBC! Finally, while the main purpose of the trip is to participate in the course, I can’t wait to further explore Tel Aviv’s vibrant culture when I’m not in class. Since it’s a condensed course, I’ll be posting blogs every few days, so be sure to check in. And on the 16th, I’ll be taking over UMBClife’s Instagram page, so follow them if you want to see my tour of the Hadassah Hospital! Until then, wish me luck on my 10-hour flight on Saturday. There are some restaurants and markets in our apartment complex, including a super-convenient grocery store and a popular coffee shop chain called Aroma. Fun fact: they actually tried to introduce Starbucks into Israel, but everyone liked Aroma better so all the Starbucks chains failed! 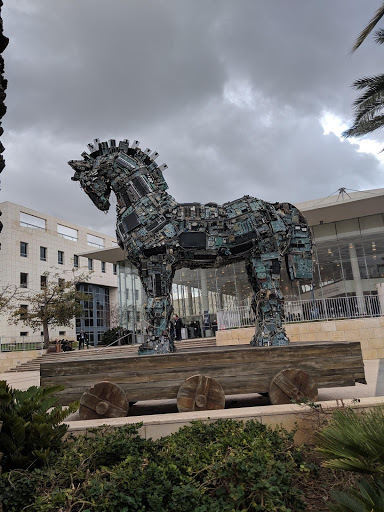 It’s a short walk to the academic buildings, and TAU’s campus is truly beautiful, with modern architecture and art sculptures throughout, including this awesome Trojan Horse made of computer parts! Another popular Tel Aviv staple are countless adorable stray cats (think triple the UMBC cat population). The folk story is that several decades ago, while Israel was still under British rule, they introduced cats to control their rat problem, and now they just have a cat problem! I personally think that’s a pretty good problem to have. Today we had our first educational field trip to Ashkelon, which is about an hour south of Tel Aviv. Did you know that Baltimore has had a sister-city partnership with Ashkelon since 2003? The Associated Jewish Federation of Baltimore has provided resources to the city, as well as taking measures to strengthen the cultural connection between the two cities. We actually visited the “Baltimore Park” in the city. We met two other amazing organizations: The Ethiopian National Project (ENP), and the American Jewish Joint Distribution Committee (JDC). As we were introduced to the Ethiopian National Project, I learned that there is a actually a large population of Jewish Ethiopians who have immigrated to Israel. We were brought to a high school that incorporates a program called SPACE (School Performance and Community Empowerment) that gives the children of Ethiopian immigrants the support to excel in school and feel more a part of their community. We got to play a get-to-know-you version of chutes and ladders with some of the high schoolers, and they were honestly just like high schoolers in the US. They love soccer, Chris Brown, and making Tik Tok videos. Many of them were tri-lingual, speaking English, Hebrew, and Amharic, an Ethiopian language. 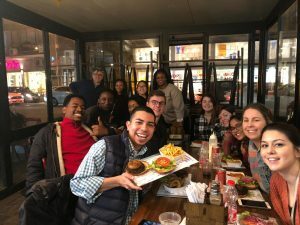 Americans might have the misconception than Judaism is a dominantly white religion, but it is just as racially diverse as all other major religions, and it’s great to see that diversity being cultivated and celebrated. Finally, we met with representatives from The American Jewish Joint Distribution Committee (referred to as just “Joint” or the JDC), which is an organization that advocates for Israelis living in poverty and those living with disabilities. Learning about their work was absolutely inspiring, especially thinking about how we face the same issues in our own country. We heard from a woman named Ada, who became wheelchair bound at the age of 32, and struggled with everything from social acceptance to finding employment. Now she helps advocate for others like her, both through educating those without disabilities, and supporting fellow Israelis with disabilities. She mentioned a program called “Other Mother” which involves a mother who has had a disability from birth or youth mentoring a newly-disabled mother. 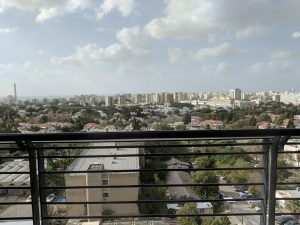 The JDC is doing a lot of work to make Israel’s infrastructure and buildings more accessible, and even trying to influence policies to make this happen. This discussion was all too relevant, given that our lecture earlier today touched on the US laws against discrimination towards federally protected groups, including those with disabilities. Don’t you love it when lectures apply to the real world? It’s very refreshing, as is seeing all of the intersectionality that flourishes in Israel. Today was truly inspiring and eye-opening. Let’s hope this remains consistent throughout the rest of the course! Bonus: This is the whole group! 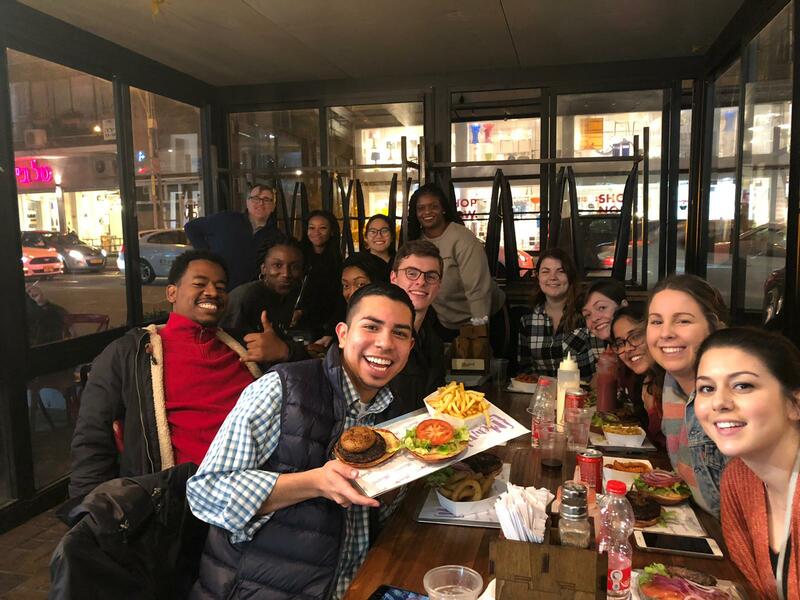 We got burgers for our first dinner as a group, as you do. A bit of time has passed since my last post, and I’ve done quite a lot since then! 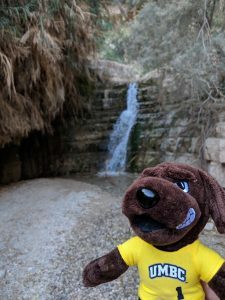 But, before I describe my wonderful weekend adventures, I figure it would be a good idea to talk more about the real reason I’m in Israel: class! This program is unique in that I am only enrolled in one course, and it’s condensed into only two weeks – 12 days, to be exact. Even if you take winter courses at UMBC, those last about three weeks, so this is extra condensed. Industrial/Organizational psychology is in fact a master’s program available at UMBC at the Shady Grove campus, so it’s great to get exposed to this quickly growing field as an undergraduate student. In our first lecture, which was actually combined with our pre-departure orientation in December, we defined I/O psychology as “the branch of psychology that applies psychology to the workplace”. This can apply to various practices, including employee selection, evaluation, and satisfaction, as well as ethics and organizational development. A lot of the subject overlaps with human resources, which our professor Dr. Lasson described as “two sides of the same coin”, but I’ve come to understand that I/O is more about the research behind how human resources works, and in a wider sense how organizations function and succeed. I had heard about I/O psychology previously, but didn’t really know much about what the field involved. That’s why when I saw that this course was available before I graduated, I immediately jumped at the opportunity. Like I mentioned in my first post, I currently work at the Career Center on campus as a Peer Advisor, where I help students with their resumes and cover letters, as well as give presentations to classes about the resources available at the Career Center. Lucky for me, I realized very soon into the first lecture that my career counseling experience has already put me at an advantage in this course, because my work gives me a inside look at employee selection processes. Part of one of our lectures was even dedicated to discussing resumes and cover letters, and it was great to hear about Dr. Lasson’s knowledge and add it to my own bank of resume-writing tips. I really enjoy my work as a peer career advisor, and as my graduation in May approaches, I am frequently thinking about the graduate programs I may want to pursue. There are countless graduate programs available in the world, especially in the field of psychology, and being exposed to as many fields as possible is very beneficial for those who are still exploring their possible career paths. Taking this course, and realizing how my experience in the Career Center relates to this field, makes me strongly consider furthering my education with a master’s in I/O psychology. Anyway, that’s the run-down on class, let me tell you about my amazing weekend! First, a quick culture lesson: Israel’s weekend is actually Friday and Saturday because of the majority of the population’s observation of the Sabbath, which is from sundown on Friday to sundown on Saturday. So on Friday (which felt like Saturday), a few classmates and I got to visit Tel Aviv’s beautiful beaches. No offense to the beaches of the East Coast, but you’ve got nothing on Tel Aviv! Beautifully clear water, smooth white sand, live music, and servers that come right to your beach chair made this an exceptional beach experience. Tel Aviv’s coast faces the west, so we were able to observe a magnificent sunset over the Mediterranean Sea (and get some pretty good selfies). 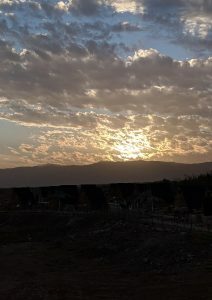 On Saturday, I woke up at 5:00am to go on a full-day bus trip to three unforgettable Israeli landmarks: the Masada National Park, Ein Gedi Nature Reserve, and the Dead Sea. There were eight of us from the course going on the tour, and all I can say is that the views were magnificent. 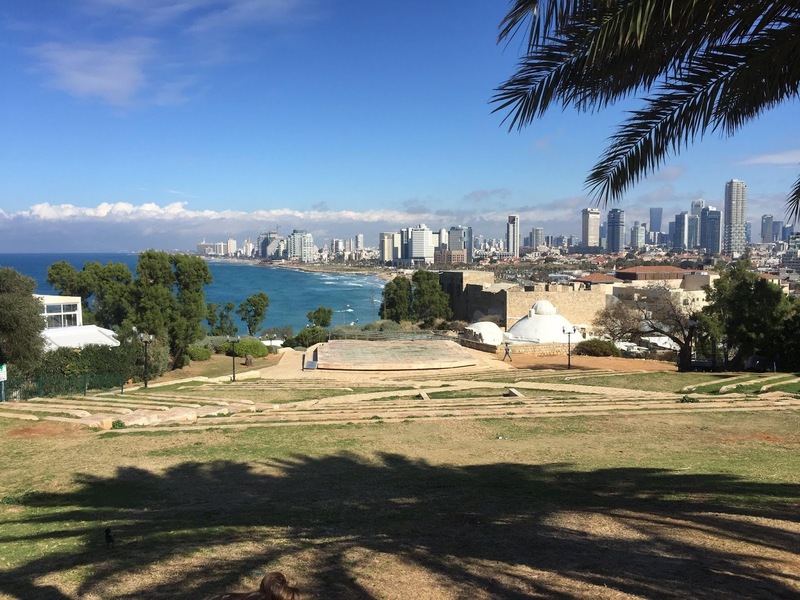 After spending a week in Tel Aviv’s buzzing metropolis, the expansive landscapes and reverent silence of these natural treasures were astounding. I can’t speak enough to how breathtaking all three of these places were, and the pictures certainly don’t do them justice. At the end of the day, as we stepped our toes into the waters of the Dead Sea, we found ourselves experiencing a sensation that was impossible to describe. I had always heard that the salinity of the Dead Sea causes people to float without any effort, but the actual feeling of being held up by water is unlike anything else that can be experienced on Earth. It was a fantastic way to close a fun-loaded weekend, and although it was hard to go back to class – just like it would be in America – I am still excited to keep learning about this fascinating field. I’m currently typing this in the Ben Gurion Airport, getting ready to board a 12-hour flight home. There’s a lot of emotions involved in leaving, and I know my fellow classmates will agree that this trip just flew by. This course has really been a whirlwind of adventures and lessons and unforgettable moments. I learned so much about Industrial/Organizational Psychology, but I also learned a lot about Israeli culture and history. 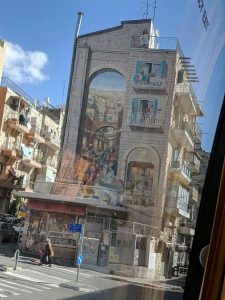 As I mentioned in my first post, I have already visited Israel last year, but that was more of a heavily-scheduled tour, whereas this course allowed me much more autonomy to explore both Tel Aviv and Jerusalem on my own terms. Through that freedom to explore, I have come to feel a deeper connection to this country. 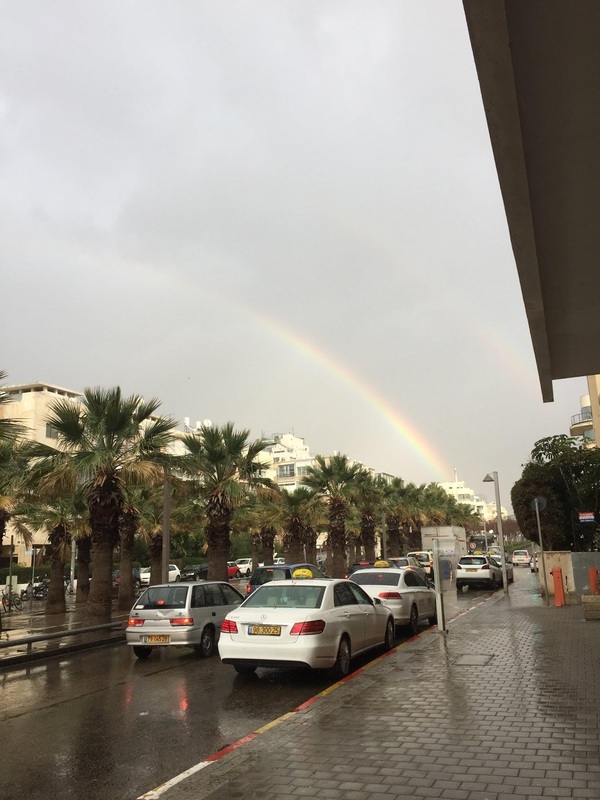 On Tuesday, we had to say goodbye to Tel Aviv and move the entire program to Jerusalem, because Tel Aviv University is actually preparing to move in all of their students for their spring semester! So, all twelve of us, plus our professor and TA, took the hour-long trip to what many consider the holiest place on Earth. 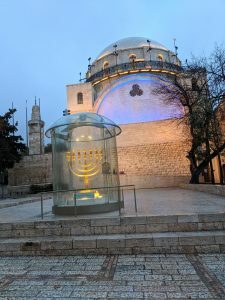 Jerusalem is a holy city for Jews, Christians, and Muslims alike, and while Tel Aviv’s beautifully modern and sleek architecture is a wonder to look at, as we drove into a city with tan stone buildings that probably stood during Roman rule, you can literally feel the thousand of years of history built into the city. 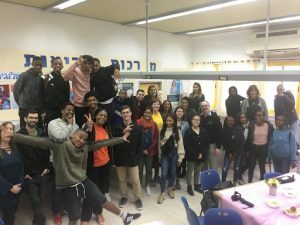 We had one more educational field trip in Jerusalem, and once again focused on the population of Jewish Ethiopian immigrants and their families. We visited Hadassah Hospital to learn about a program supports Israeli Ethiopian youth through nursing school. How does this connect to I/O psychology? Well, we actually spoke to a woman working with the program whose degree is in I/O. She discussed how creating and maintaining this program requires constant surveys and evaluation, the development of which require a background in I/O. They created a survey to determine that a nursing program would best serve the Israeli-Ethiopian youth. They had to develop the interview process to screen applicants into the program. Finally, they had to create evaluations to determine how the first year of the program succeeded and how it needed to improve. Nobody thinks about it, but all of these surveys and interviews need to be created by somebody – I/O psychologists. It was great to see everything we’ve learned in class being applied to an organization making a real positive change in Israel. After leaving the hospital, we embarked on a less course-related field trip into the Old City of Jerusalem, which is a walled-in section of the city that is home to countless significant religious and historical sites. A tour guide brought us through vibrant markets, past magnificent churches and synagogues, and allowed us to spend time at the Western Wall. 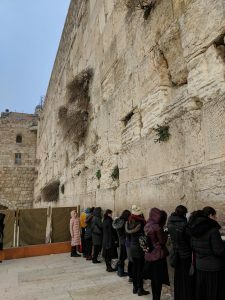 The Western Wall is the remnants of the wall surrounding the former site of the second Jewish Temple of Jerusalem, and widely regarded as the holiest location in the Jewish faith. Even with the wind and the rain present yesterday, the atmosphere of this site was solemn and reverent. Dozens of people (it can be in the hundreds on days with better weather) were leaning towards the wall, touching it, whispering prayers, even writing prayers and leaving them between the stones. Even as a nonreligious person, I can’t deny the electric energy in the air at such an emotional site. As the tour concluded and we went back to our hostel, something truly remarkable occurred: it started to snow. I know everyone reading this on the east coast is scoffing, because you had several inches of snow last week. But it hasn’t snowed in Jerusalem in over four years – that’s a big deal! It was quite beautiful seeing the white snow accumulate on the tan stones, and without getting too cheesy, it kind of felt like Israel was saying goodbye. 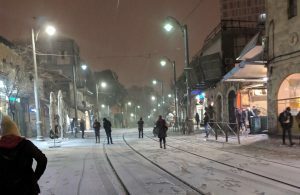 What are the odds that this historical snow would occur on the program’s last full day in Israel? I felt really privileged to witness this scene, and it almost makes me sadder to leave. Overall, this program has been so beneficial to me in so many ways, and I’ll be making one last post once I’m stateside and had more time to reflect on my experience. 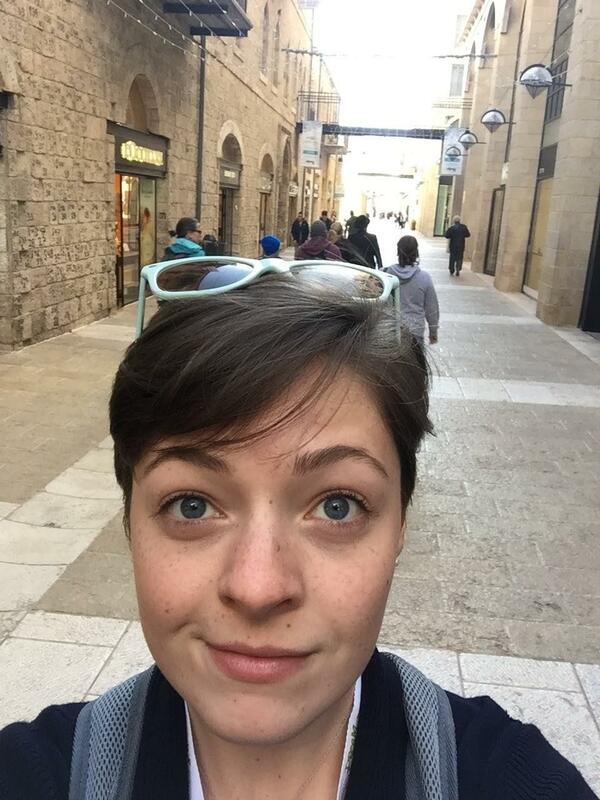 Thanks for following me through my experience in Israel! Why did I give myself the hardest question first? I guess I would say my favorite part of this program was the educational field trips. During lecture, I really felt like I could have still been at UMBC. But the two scheduled field trips to Ashkelon and the Hadassah Hospital allowed me to gain an education on Israel, and not just Industrial/Organizational Psychology. 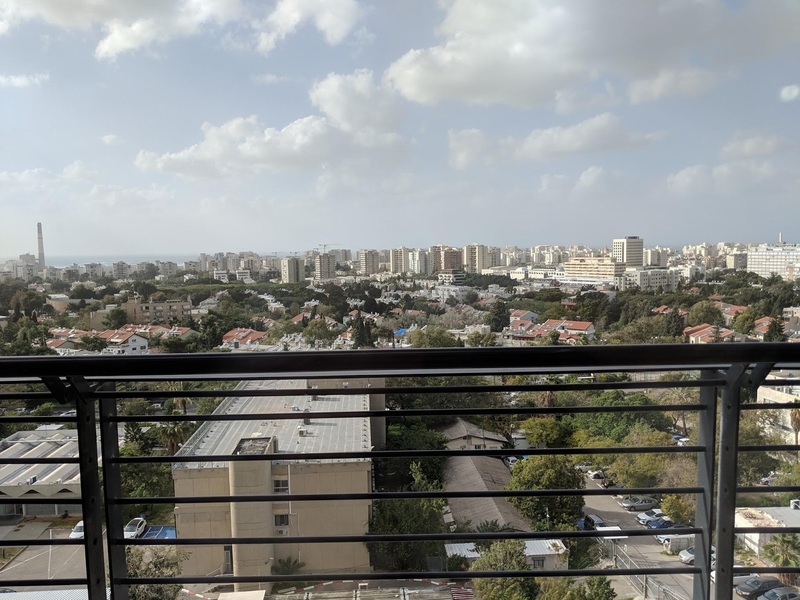 Being able to meet businesses and nonprofits, as well as the people that they serve, gave me a more personal look into what living in Israel is like, and what social issues are important to Israeli citizens. 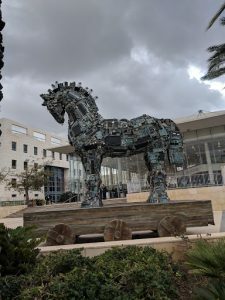 I got to learn more about Israel through these field trips, but I also got a better sense of how what I learned about I/O applies to real-world situations. My original assumption was that I/O psychologists mostly work with corporations and executives, but now I know they can work with groups that are trying to make a real difference for people who need help. These field trips were one-in-a-lifetime experiences, and they definitely made a lasting impression on me. What was the hardest experience while you were there? The hardest part of the program was the almost total independence I had outside of lecture and the field trips. The only other times I have traveled internationally were on highly scheduled tour programs where everything was already planned out and paid for, so having to pay for everything (food, travel, fun stuff) and schedule my day all on my own was a little intimidating. Luckily, my classmates and I became fast friends, so it was easier to travel and buy food together rather than do everything alone. This program really was an exercise in independence for me, and although it was a challenge, I think I did really well for myself. And I’m keeping my bus card (called a “rav kav”) as a token of how I mastered Israel’s public transportation system like a pro! How was your program unique? This program was the first time UMBC offered a faculty-led program during the winter semester, so basically everything about the program was unique. 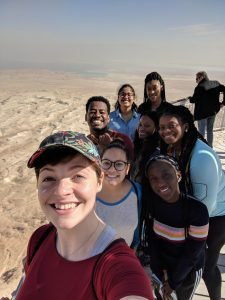 Compared to a conventional semester abroad where you might take a couple classes, we only participated in one class while we were there, taught by a UMBC professor. Also, everyone in the class was a UMBC student (except for some Israeli grad students that sat in on our class), so we already had a sense of connection at the start of the program. There are seven different UMBC Faculty-led programs available this summer in a variety of subjects, so I would absolutely recommend checking those out and applying! What advice would you give those looking to study abroad in the future? No matter what situation you have, there is a program available for you. I never studied abroad before because I thought I could only go during the fall and spring semester. I a) was afraid of being away from home for so long and b) didn’t want to sacrifice the things I have established here like my job and my theater hobby. That’s why when I saw this two-week program available in the winter, I knew this was my chance! Everyone has their own situations in life, whether it has to do with money or anxiety or graduating on time, but the Study Abroad office can work with you to find a program that fits all of your needs! It would be so sad to graduate college with regrets, wishing you had gone abroad at some point. Coming from someone who is graduating in May, it is seriously never too late to study abroad. The resources are out there, you just have to do a little digging! And I am so glad that I did. I hope I gave some good answers! This class taught me so much, both in and out of lecture. I think it will still take me a few weeks to fully process and reflect on everything that I experienced, but these blogs have helped me so much in cultivating a greater appreciation for the extraordinary experience I was privileged to have. There’s only a few days until the spring semester starts up again, so I have a few more days to relax before jumping right back into class. Wish me luck!